Win a day with Andrew Hoy! One lucky winner will have the chance to win an exclusive day with Australian Gold Medallist and Sponsored Equistro rider Andrew Hoy! You will get the chance to take your horse to Andrew’s Somerby stables in Leicestershire for a whole day of training with the man himself, have a tour of the stables and meet the horses. After starting riding from an early age, Andrew was 19 when he took part at his first international championships for Australia at the 1978 World Championships in Kentucky. Since then Andrew has represented Australia at seven Olympic Games, winning three consecutive Olympic Team Gold medals, 1 Olympic Individual silver and four World Championship medals. 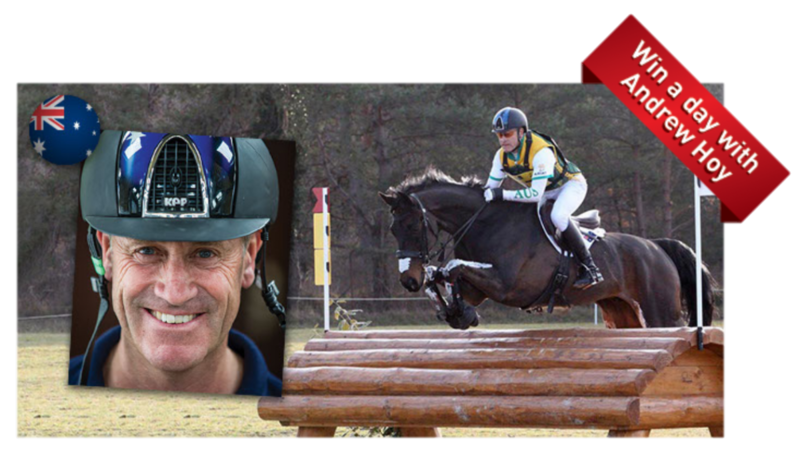 To see what Andrew says about being part of the Equistro team and to see who our other sponsored riders are, click here. Terms & conditions: The “Win a day with Andrew Hoy” competition is open to all UK residents aged 18 years or over who has completed the above survey. To enter the prize draw you must submit your full name, telephone number and email address. No purchase is necessary. The winner will have to own/have access to their own horse for the day. If you have any questions regarding the competition, please speak to a member of the team on the Vetoquinol (Equistro®) stand at The Festival of British Eventing 2016 or by email at uk_marketing@vetoquinol.co.uk. Entrants must meet the eligibility requirements as specified herein. Failure to meet the eligibility requirements may result in an entry being invalid and/or forfeiture of any prize. Only one entry allowed per person. Entries on behalf of another person will not be accepted and joint submissions are not allowed. Vetoquinol accepts no responsibility for entries that are lost, delayed, misdirected or incomplete or cannot be delivered or entered for any technical or other reason. The closing time for entry of the competition is 7pm on Wednesday 7th September 2016. Entries received after this time will not be considered. One winner will be chosen from a random draw of entries received in accordance with these terms and conditions. The draw will be performed by a random computer process. The draw will take place on 8th September 2016. The winner will receive a day with Andrew Hoy at Somerby Stables, Oakham Road, Somerby, Leicestershire, LE14 2QF, United Kingdom, with lunch and drinks provided. The winner must arrange transportation for themselves and their horse. Vetoquinol will cover travel costs up to £100 in order for the winner to travel from their home to Somerby Stables. The winner is responsible for expenses and arrangements not specifically included in the prizes, including any necessary clothing, accommodation and food. The winner will be notified by email/telephone on or before 12th September 2016 and must provide a postal address to claim the prize. If a winner does not respond to Vetoquinol within 14 days of being notified by our team, then the winner's prize will be forfeited and Vetoquinol shall be entitled to select another winner in accordance with the process described above. If a winner rejects their prize or the entry is invalid or in breach of these terms and conditions, the winner's prize will be forfeited and Vetoquinol shall be entitled to select another winner. The winner will be announced on Vetoquinol's Facebook page and corporate emails and must be available on request after the 12th September 2016. The prize is non-exchangeable, non-transferable, and is not redeemable for cash or other prizes. The promoter reserves the right to cancel or amend the competition and these terms and conditions without notice in the event of a catastrophe, war, civil or military disturbance, act of God or any actual or anticipated breach of any applicable law or regulation or any other event outside of the promoter’s control. Any changes to the competition will be notified to entrants as soon as possible by the promoter. Vetoquinol also reserves the right to cancel the competition if circumstances arise outside of its control. The winner may be asked to take part in promotional activity relating to the prize draw and the winner shall participate in such activity upon reasonable request. The winner consents to the use by Vetoquinol, both before and after the closing date of the prize draw for an unlimited time, of the winner's image, photograph and name for publicity purposes (in any medium, including still photographs and films and on the internet, including any websites hosted by Vetoquinol), and in advertising, marketing or promotional material without additional compensation or prior notice and, in entering the prize draw, all entrants consent to the same. Promoter: Vetoquinol UK Ltd, Vetoquinol House, Great Slade, Buckingham, MK18 1PA. Tel: 01280 814500.